There are certain nights when it’s bone chilling cold and all I want is a comfort food from the old country. One like mom used to make in the brisk winters in Moldova. My answer is typically something hearty and warm. Something that will warm my innards up and remind me of simpler times in my childhood. Enter galubtsi. 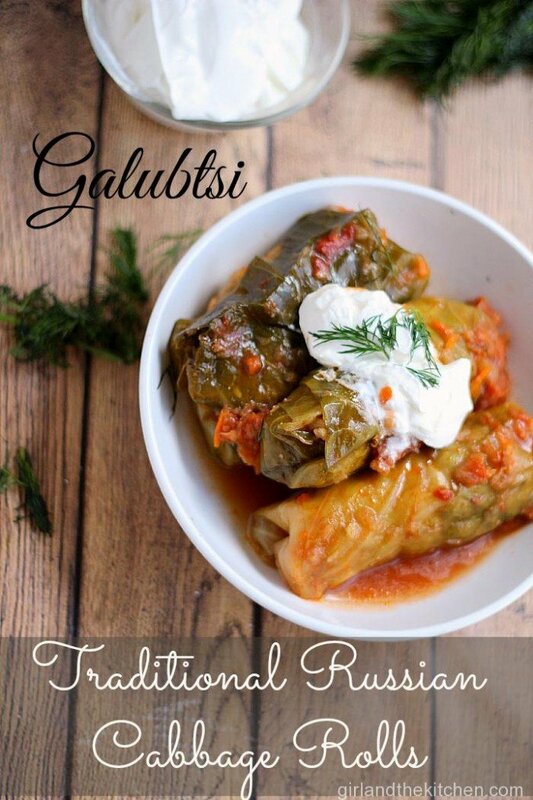 Galuptsi are stuffed Russian cabbage rolls. But these are not those tomato sauce and ketchup soaked, stinky cabbage rolls. These are delicate, tender and most importantly delicious. 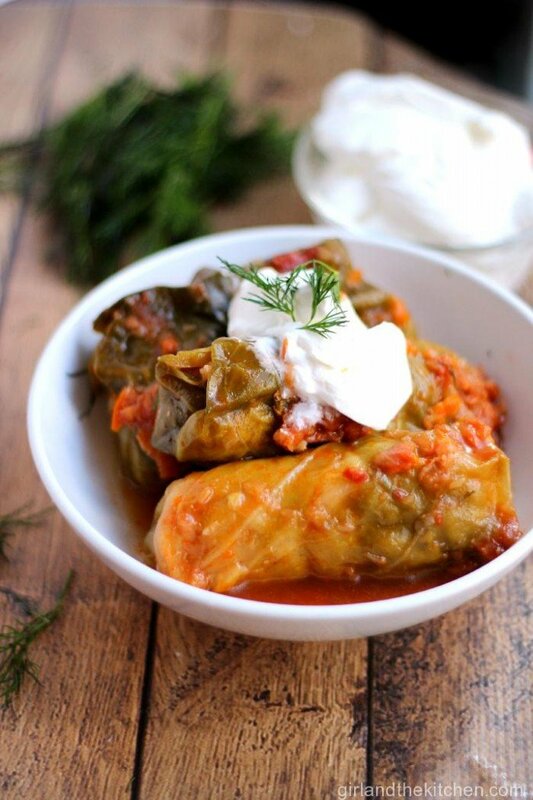 Every Eastern European country has their own way of making stuffed cabbage. 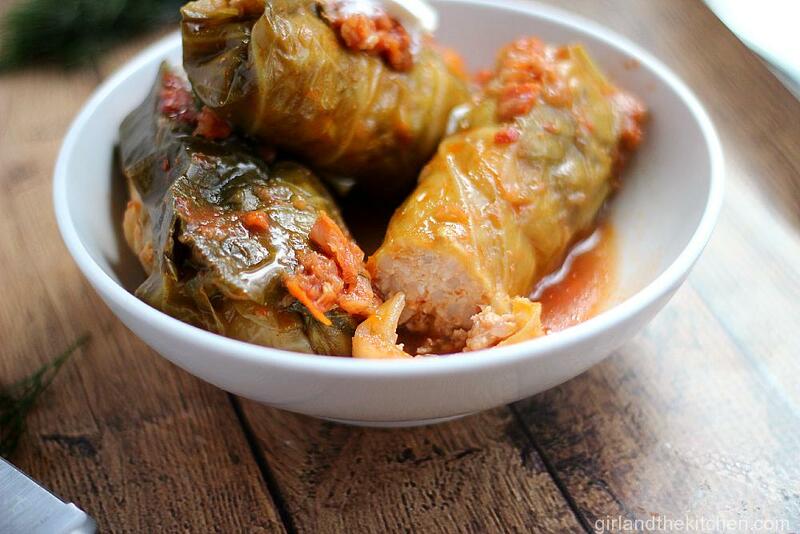 My mother used to make it the Moldovian/Romanian way, with lots of greenery like parsley, dill, scallions and cubes of beef and she incorporated a bit of the middle eastern influence and used grape leaves and cabbage leaves to wrap the filling in. They were more like a dolmade rather than typical galuptsi. When I started dating my husband, I realized how different our food was even though we spoke the same language. His parents made the “Galuptsi” using only cabbage leaves and stuffed them with ground pork, a bit of rice, cooked carrots and onions. Whereas my mother’s galuptsi fell apart when you cut into them, my husband’s parents’ were one big oval shaped ball, but they were tender and delicious! Completely different but sooo good! Since my hubby grew up on this food I decided to please his palate and make them for him thisway. I made this recipe a few years ago and since then, I have changed the recipe up a bit. I use a combination of ground dark turkey meat and ground pork. It packs a lot of flavor this way and also helps the meat stay nice and moist from the pork fat. Remember pork fat is king I also add in brown rice instead of white rice and I find it makes no difference whatsoever in the flavor profile or the texture. 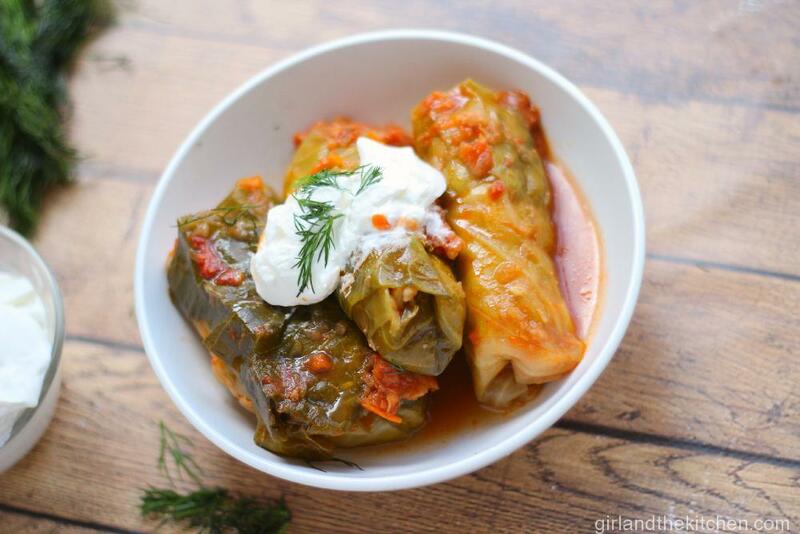 When I introduce this cabbage roll recipe to friends and clients, they instantly back away because they become intimidated at its complexity. However, I think people forget that there is a difference between complicated and time consuming. Complicated is a multi color clown made out of sugar. This is not like that. This does take a bit of time. However, the beauty of this cabbage roll recipe is that it freezes amazingly well. In fact, there were several times that I made it ahead of time on purpose, because it tasted so much better defrosted. 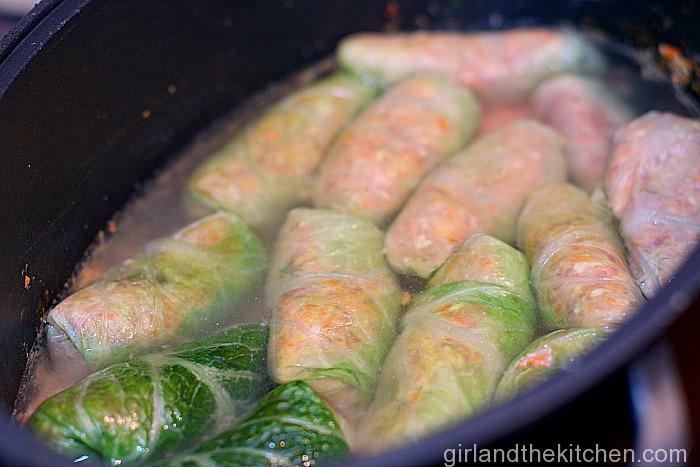 Therefore keep in mind with this cabbage roll recipe in particular makes a very large batch. Make it one night…then freeze half or all or some. And when it’s time to reheat, just place it in a nice slow oven and reheat it slowly. Serve them with a dollop of sour cream, some crusty bread and a simple cucumber, tomato and red onion salad and I promise you and your family will be asking for more! I start this recipe the night before. My mom taught me a really neat trick way back when. Instead of boiling the head of cabbage, for the cabbage rolls, throw it into the freezer the night before making this recipe. Then thaw it out in the morning the following day. 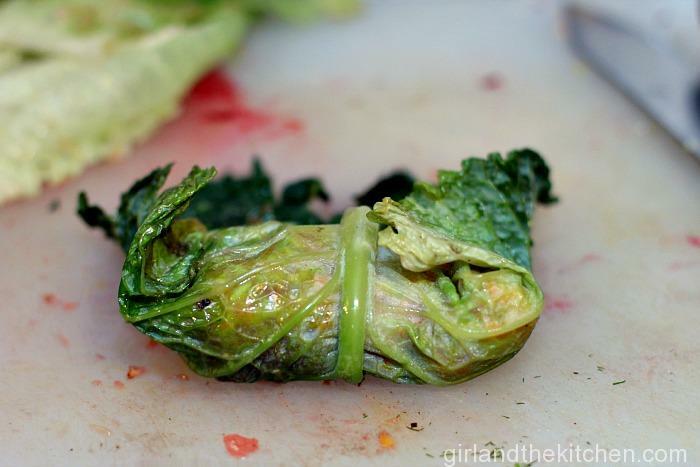 You will have perfect, pliable cabbage leaves, ready to be rolled. 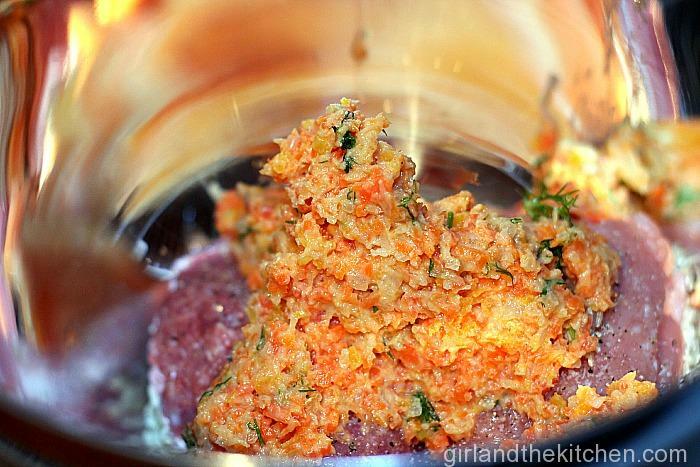 I use my Vitamix for the carrot and onions. You can also use your shredder attachment on a food processor or grate them on a box grater. 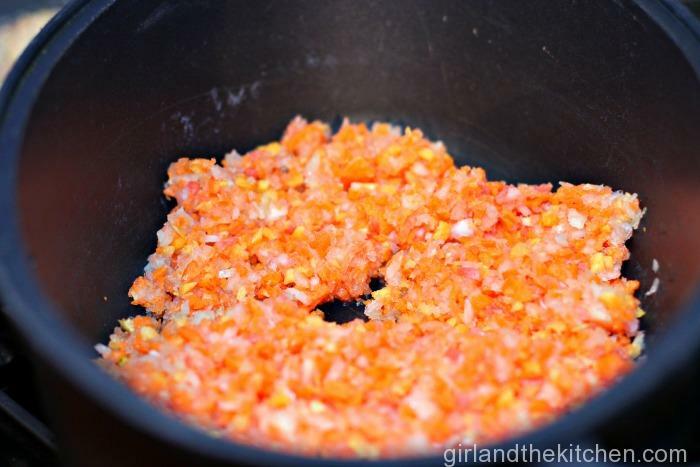 If using a Vitamix you are going to want to do the wet chop method: Throw all your carrots and onions in the Vitamix and fill up with water until all veggies are covered. Pulse on high until everything is shredded nicely. Now pour into a strainer to get rid of the water. Place a tablespoon of olive in a heavy bottomed pot and place your veggies in there over medium heat. Sprinkle in some salt and pepper. Sweat them out for about 15 minutes. You do not want them to brown you just want them to get aromatic and soft. After the veggies have sweated out for a bit, add in your dill, tomato puree and sour cream; stir to combine. See how creamy it’s getting? That’s what you want. That will help hold the mix together as well as add killer flavor. Place this on a flat plate or bowl and let cool in the freezer for 10 minutes. 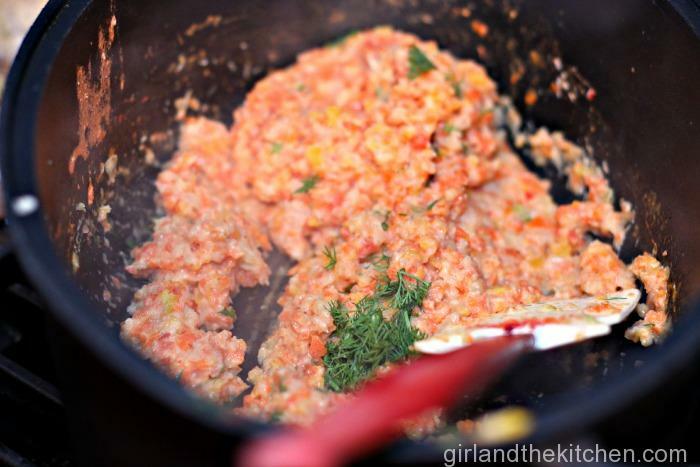 Once cool to the touch, combine 3/4 of the vegetable mix, rice, turkey, pork and seasoning. Mix everything together so it is well mixed. Take a small piece and fry on a small pan to taste for seasoning. Add in as necessary. Take one cabbage leave and place about 2 tablespoons of the meat mixture in the middle. If the leaves are smaller, you can place 1 tablespoon. Look at the picture see how there is a “v” cut out. That was the hard part of the stem that I removed. 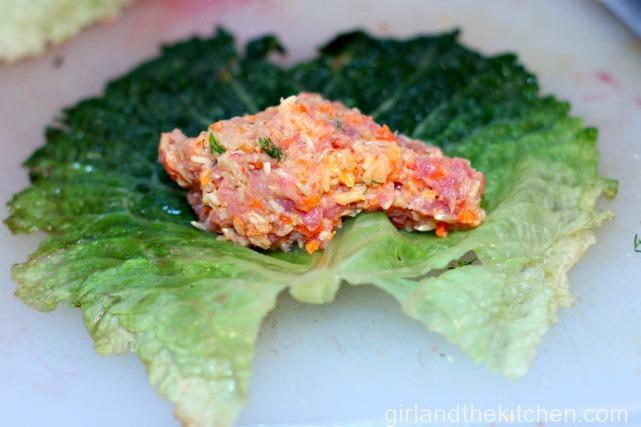 Take the middle part of the leaf and cover up the meat with it. Now, take the two ends and fold them inwards. And now just roll it up like a burrito. Do the same for the rest, placing them tightly in the pot. Cover with boiling water so that they are covered about halfway and top with the remaining veggie mixture. If you have remaining cabbage leaves you can layer them on top. Cover with a lid or with aluminum foil and place into a 325-degree oven and cook for 1.5-2 hours or until meat is nice and tender. You can do this on the stove top as well. Do not let them boil as they can unravel. I start this recipe the night before. My mom taught me a really neat trick way back when. Instead of boiling the head of cabbage, throw it into the freezer the night before making this recipe. Then thaw it out in the morning the following day. 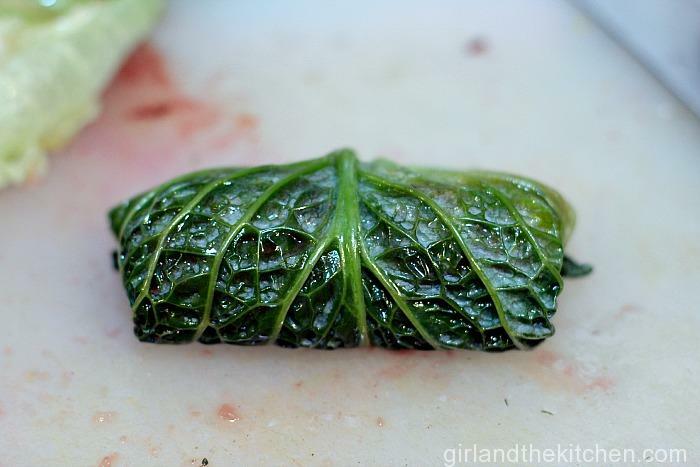 You will have perfect, pliable cabbage leaves, ready to be rolled. 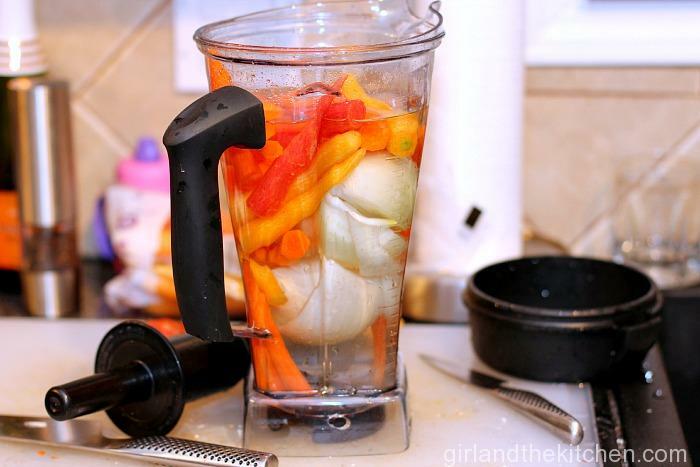 Throw all your carrots and onions in the Vitamix and fill up with water until all veggies are covered. Pulse on high until everything is shredded nicely. Now pour into a strainer to get rid of the water. Place a tablespoon of olive in a heavy bottomed pot and place your veggies in there over medium heat. Sprinkle in some salt and pepper. Sweat them out for about 15 minutes. You do not want them to brown you just want them to get aromatic and soft. Place this on a flat plate or bowl and let cool in the freezer for 10 minutes. Once cool to the touch, combine ¾ of the vegetable mix, rice, turkey, pork and seasoning. Mix everything together so it is well mixed. Take a small piece and fry on a small pan to taste for seasoning. Add in as necessary. Take one cabbage leave and place about 2 tablespoons of the meat mixture in the middle. If the leaves are smaller, you can place 1 tablespoon. Look at the picture see how there is a “v” cut out. That was the hard part of the stem that I removed. 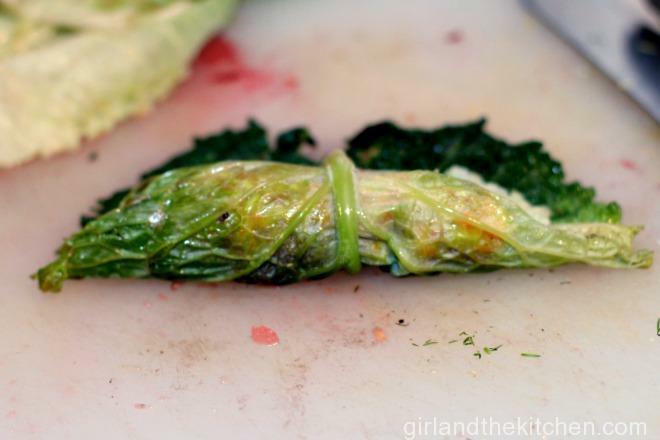 If you have remaining cabbage leaves you can layer them on top. Cover with a lid or with aluminum foil and place into a 325-degree oven and cook for 1.5-2 hours or until meat is nice and tender.